The Tower of London is a magnificent medieval fortress, perfectly preserved. With a past of nearly 1000 years she has experienced all the great periods in the history of England, and has served many personal ambitions over time. Nowadays demilitarized, it is one of the main tourist sites of the British capital, and its quality justifies perfectly the time that you will spend there. At the Tower of London there are no guided tours, you can certainly take a guided tour, but if you wish, you can walk around the castle all day. There is no imposed order in the discovery of places. The rest of this document gives an example of a visit, but it is not mandatory, of course. NOTE: For rates, opening times and other services, see Visiting the Tower of London. La tour de Londres, vue de la Tamise. The main entrance to the Tower of London is on the east side, near the Thames. The most convenient is to come by metro. The nearest station is Tower Hill, on the "District" (Green) or "Circle (Yellow)" line. When you exit the underground, you are directly opposite the Tower of London. which you see first, is the first row of fortifications, rather low and massive, and just behind the second row, which is equipped with defensive towers. You arrive in front of the Flint tower. In front of you, in the moat, you can see the recent discoveries concerning the location of the buildings of Roman origin, at the time when London was called Londinium. These ruins mark the interest of the Romans for this site and proves that through the ages, it was made to welcome a stronghold. Continue your way to the square on your right, the entrance is through the intermediate tower. It's just after you find the Yeoman Warder. They are the guardians of the tower, since the fourteenth century. They are perfectly recognizable with their black outfits embroidered with red, with the arms of d'Elizabeth II. Yeoman Warders offer free guided tours of the fortress. For 60 minutes, and with the group he set up on his departure, he will tell you the history of the tower and why it has such a great heritage interest. Note that you can reserve them privately for a more personalized tour, it is done at the Lanthorn tower. The intermediate door once had a drawbridge. Until 1843 the moats were flooded, but on that date they were dried up and partially filled with soil, because two years earlier, stagnant water had caused the death of several soldiers, through contamination of drinking water. Pass the intermediate tower you cross the moat and pass under the Byward tower. The two doors look very much alike. Right after you will see the information kiosk. It is open all day and the staff helps you as much as it can for you to visit. On your left you see the Bell Tower, the second oldest tower of the castle after thewhite tower. It forms an angle between the Mint street, which runs northward, and the water lane, which runs along the Thames. The outer enclosure in which you are now was built by Edward I during his expansion of the tower between 1275 and 1285. All the southern part of the extensions was taken on the bank of the Thames. He built a rampart there and the outer quays to improve the south face of the fortress, which formed a space between the old rampart and the new one, it is called the street of the shore. Walk there until you meet the traitors gate on your right. This entrance, opened on the Thames, was used for transport to the tower of the prisoners of State. Many personalities have passed through there, depending on the vividness of history. We can quote Queen Anne Boleyn, or Sir Thomas Moore. The building above the door of the treaties is the tower of St. Thomas, it was built in 1275 under Edward I to enlarge the royal palace but also to create a new entrance, fluvial that, to the fortress. Continue your walk along this street and pass in front of the Wakefield Tower, the Lanthorn Tower, the Cradle Tower, the Salt Tower, the Well Tower and the Develin Tower. The Henry III gate made it possible to reach the wharf directly from the Thames to join the Wakefield Tower. Of course this door was permanently guarded by soldiers who had the role of controlling the comings and goings in the fortress. The Wakefield Tower was built between 1220 and 1240 during the reign of Henry III (1216-1276). 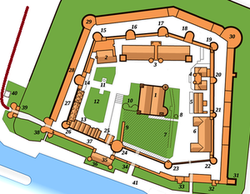 Although it was the king's main residence, it was also an important part of the defense of the fortress. The upstairs room, which was the King's private room, lost its role under Edward I who turned it into a sort of anti-chamber. His real room was, for him, at the door of St. Thomas. It was assumed that the anti-chamber thus recovered might have served as the halls of the throne. The fact remains that today a copy of the throne that we see in Westminster Abbey is there. On the death of Edward I the private apartments of the King of the Wakefield Tower were abandoned to pass to the Lanthorn Tower. The latter was built at the same time as the Wakefield, it initially contained the Queen's apartment. It was partially destroyed by a fire in 1774, and thus remained in ruins. The tower that we see today dates from the nineteenth century and contains a number of objects from the time of Edward I. If you enter the inner courtyard from the Lanthorn tower, you will cross the ancient Roman wall, that of the city of Londinium. It encircled the ancient city, but over time it was left fallow. When William the Conqueror decided to build a dungeon to control the city, he chose the southeast corner of this enclosure, which is why it is still partially found on the spot. At this moment you have on your right the workshops and on your left and in front of you, the famous white tower. Go to the entrance to the white tower. This large structure was built towards the end of the eleventh century, at that time it was the tallest building in London, with its 27m high. Its walls are 4.6m thick at the base and 3.3 at the top. It is built of Kent river stone and the corners are in Caen stone, in Normandy. This tower was built for the comfort of the king and the constable (the commander of the fortress, who commanded the garrison). The two shared the floors of the building, the constable below, and the king above. Later, when the inner rampart was built, the king took up his quarters in the Wakefield tower, keeping the white tower only to ensure his safety. 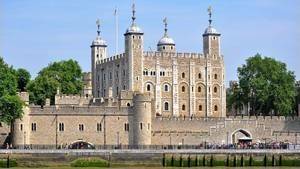 At the end of the reign of Elizabeth I the white tower became an armory, a cellar and a wardrobe. In the eighteenth century most of the rooms served as a place of storage for military purposes. Inside the white tower you can admire permanent exhibitions on different levels. There is a large amount of armor, weapons of war, tournaments, hunting and self-defense. There are also many Saxon and Viking objects, from the old days to the present day. On the second floor there is the St John the Evangelist. Although it is fairly simple, it is a good example of Norman architecture, made of finely squared stones, although without decoration. Still in the inner courtyard, to the south of the white tower, are the cages of the crows. As famous as the Yeoman Warders, crows are undoubtedly the most known inhabitants of the tower. It is 900 years since the tower shelters crows. The legend tells that Charles II would have prophesied that if the crows leave the Tower of London, the monarchy would collapse. As a result, he imposed a few crows on the spot to be sure they did not leave. And they're still there. The crows population almost disappeared once in the history of the Tower of London. It was during the Second World War, a period during which only a raven lived. Of course the managers quickly managed to complete the group. Each raven is identified by a ring of color which girds its paw. They respond to their names, but only to their trainers. They are also able to attack to defend their territories. From the crows to the crows take the northern direction along the white tower to the place of execution. It is an area of the inner courtyard where executions of the personalities having had the privilege of being executed in small committee. The others were in Tower Hill, just north of the Tower of London, at a place that could bring the crowd together. This place, in the Tower of London, is called in English "Green tower". It was here that two Queens of England (Anne Boleyn and Catherine Howeard) were murdered. Just to the north of this place there is a chapel, the royal chapel dedicated to St. Peter Ad Vincula. It is open to the public and is part of the Yeoman warders tour (except Sundays). Then you have to go to the tower Beauchamp which is in the ramparts but whose entrance is at this place. The Beauchamp Tower was essentially used as a prison. The next step is the Waterloo barracks. It is the great building in front of you, in a neo-Gothic style. It was built by the Duke of Wellington (who had his hour of glory in winning the battle of Waterloo, which marked the fall of the Napoleonic Empire). The purpose of this building was to house 1,000 soldiers in a modern garrison, with an officer quarters. Either it can not be visited, but as it contains the jewels of the crown, it is one of the high places of the Tower of London. The jewels of the crown have been exposed to the Tower of London since the 14th century. They are still used by the royal family. The jewels are shown in different showcases on several successive rooms. For the most popular pieces, you have to go through treadmills that streamline visitors' traffic. Most of the pieces in this collection date from the restoration of the monarchy in 1660, when Charles II ascended the throne following the defeat of Oliver Cromwell. The latter had ordered all the old jewels to be destroyed, gold and silver mixed, and sold to the advantage of the Commonwealth. The collection contains some incredible pieces like the Imperial State Crown made that Queen Victoria made do in 1837 and that is still used in the coronation ceremony. The jewels of the crown are reputed to be the largest and most expensive jewelry collection in the world. There is the "First Star of Africa", a 530 carat diamond, simply the heaviest in the world. It is set in the top of the scepter at the cross, one of the symbols of the English monarchy. When you have finished admiring the jewels you can go to the headquarters of the fusilliers and more exactly to his museum. The royal regiment of fusilliers was founded in 1685 by James II (1685-1688) to protect the armaments in the tower. It is the first regiment to have been endowed with muskets, the ancestor of the rifle, hence its name. Inside the museum you will find information about the history of this regiment, the conflicts it has taken part in, the Napoleonic War, the war of independence of the United States, the Crimean War, the Boer War, two world wars, the war in Northern Ireland and more recently, the Gulf War. After visiting the museum of fusilliers take the north-east direction, there are some shops in the corner of the inner courtyard. This is where the walk of the ramparts begins. The houses near the fusilliers date from 1700, they were initially the residences of the officers or the ordinances, then were the premises of the hospital for the garrison. Follow the round trail along the south until you reach the rampart above the Thames. You go out to the salt tower. The ground floor of the salt tower was used as a warehouse during times of peace, but as a war, when when the tower came on alert, this tower was cleared to allow the archers to defend the fortress . The first floor contained a large fireplace and the archers also took their place here. It was here that John Baliol, king of Scotland was captured (1292-1296) by Edward I during the thirteenth century. During the queen of Elizabeth I this room was a cell where Catholics were locked up. Even today we can read engraved inscriptions in the walls, they were made by the prisoners. Then, to follow a classic visit and see the maximum of things, go back to the North. You have already passed by, the route runs along the white tower on your left and the workshops, then the hospital on your right. Go up the rampart, but this time, go north. You are currently following the old roundabout that runs through several towers: Brick Tower, Arrow Tower, Flint Tower, Devereux Tower. All are alike, but each one has its own particularity, beginning with its content. Some reproduce life in medieval times, others exhibit permanent exhibitions, others offer children's games based on the discovery of English chivalry. The round path also shows you a splendid view of the north of the city, with the ditch, and beyond the avenue the skyline of the modern London buildings. If you wish you can stop there. In this case take the water lane near the bloody tower and go out to the tower St Thomas, near the gate of the docks. You go out through the second passage to cross the ramparts, the Henry III. Then you can stroll along the docks. When the Tower of London was used essentially as a warehouse, most of this area was used as ammunition storage and was occupied by foundries to manufacture cannons, weapons factory and training facilities. It was also a place of ceremonies when the great dignitaries arrived by boat, it was here that they accosted. You just have to follow the quays, you find yourself near the towers Bywards, at the entrance. Do not forget to go for a ride to the Tower Bridge, it's just there, a stone's throw away! Here you have made a good tour of this fortress. Count a good half day. On the other hand, you do not want everything seen, this course is just for information. So you can, without any problem, spend time in the different towers, explore the Mint street and the casemates, stroll near the wall of the old enclosure, and so on.